This past weekend I was able to participate in a Wedding Event hosted by Papyrus. 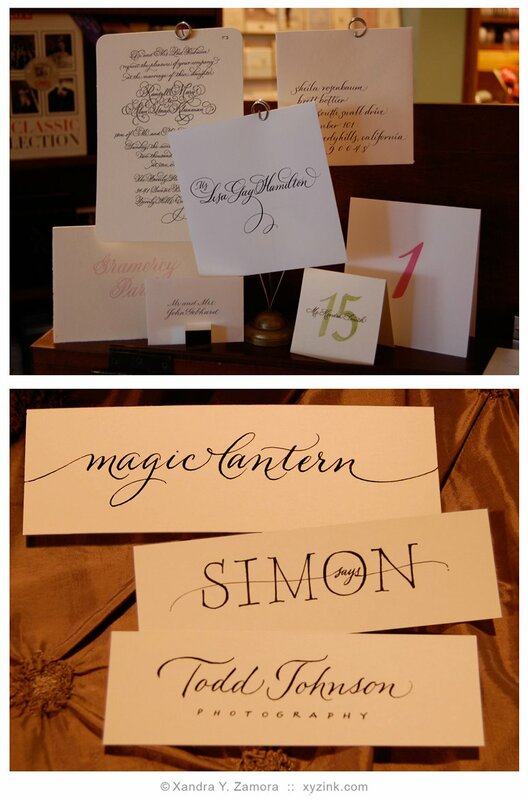 I enjoyed meeting some very nice people while providing their names in calligraphy. At the Studio City location the first thing I saw upon entering the store was a terrific floral arrangement provided by DellaRobbia. Todd Johnson displayed some innovative photography, Donna Wisdom showed some great tablescape options. There was a lovely cake and darling cupcakes from Big Sugar Bake Shop, and my chocoholic husband said the mini cupcake I brought home to him was delicious. Sunday at the Topanga Plaza store, there was an equally gorgeous arrangement on display at the store entrance, provided by Mr. B’s Flowers. Photographs by Christopher Glenn were on display, many in Papyrus frames that are classic and elegant to contemporary and fun. For most of the day we were serenaded by a classical guitarist, and there were three girls modeling some absolutely beautiful wedding gowns. Cake samples were provided by Doan’s Bakery and the White Chocolate Coconut was scrumptious! My favourite part, however, was the small world meeting that I had with the catering company Someone’s in the Kitchen. Although we have never worked together, as it happens, we both did work for Nicole and Michael who were married last October in Malibu. 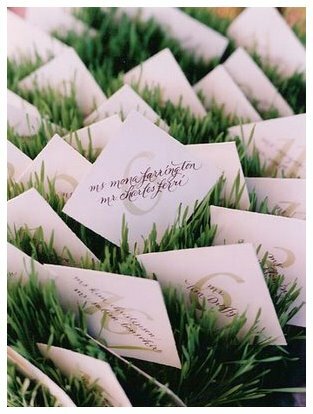 The event was organized by Sasha Souza and you can check out a tiny bit of my work on the table number and seating cards for this wedding. 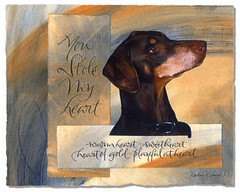 A mere thank you doesn’t seem to adequately express my appreciation to Rosemary Hattenbach of The Bride’s Nest for her overwhelmingly wonderful comments about my work. Thank you SO VERY MUCH Rosemary! It was an honour to have been asked to create the logo for this year’s IAMPETH convention. 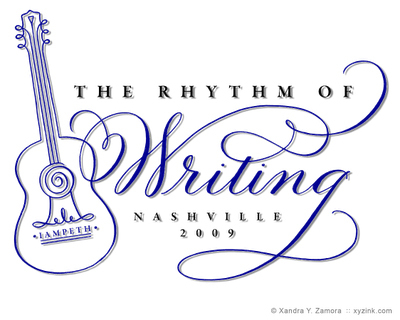 James Ivey, the guild’s webmaster, spiffed it up wonderfully with colour and a drop shadow…. 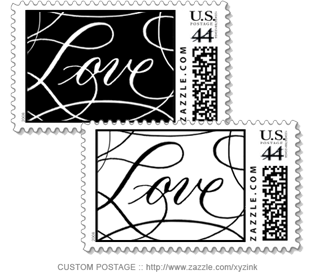 You’ve gotta love that we mere mortals now have the power to make postage stamps. Here is a set I created for the black-and-white themed wedding of Stacey Gardner and Mardy Fish. 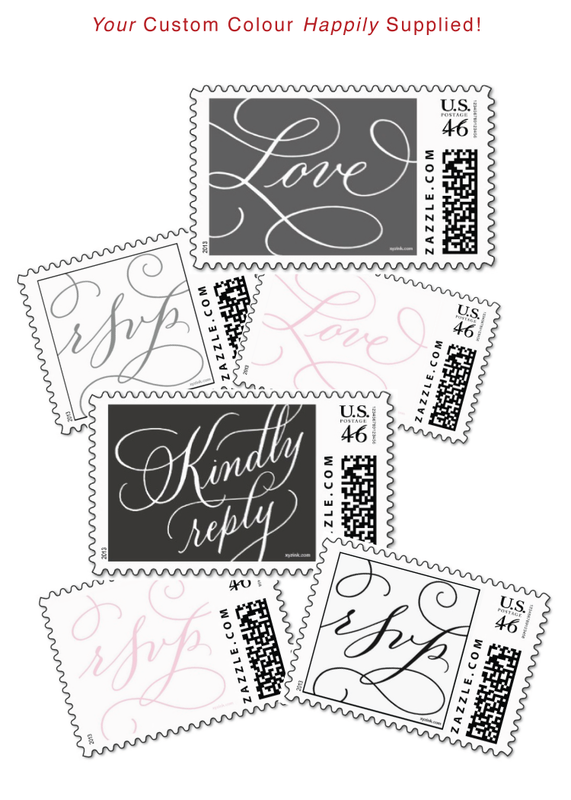 You can purchase these on Zazzle or, if you think you’d like a different colour combo, just drop me a note! 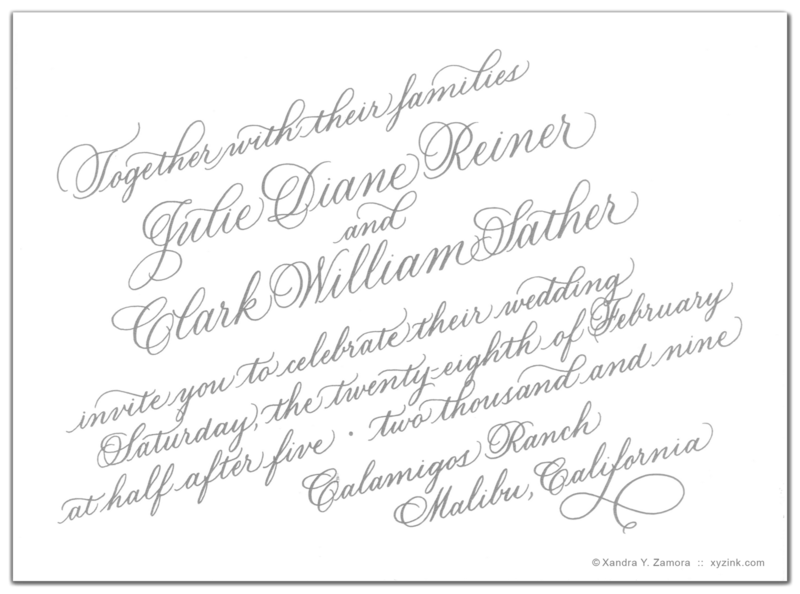 After seeing an invitation layout similar to this in a bridal magazine, Julie had me create calligraphy for her invitation. Isn’t this fun?! Last year I had the opportunity to design an invitation and the reception pieces for Kaitlin Olson and Rob McElhenney’s wedding in September. The couple star in the FX Channel’s show It’s Always Sunny in Philadelphia. It was important to them to keep their wedding as “green” as possible. 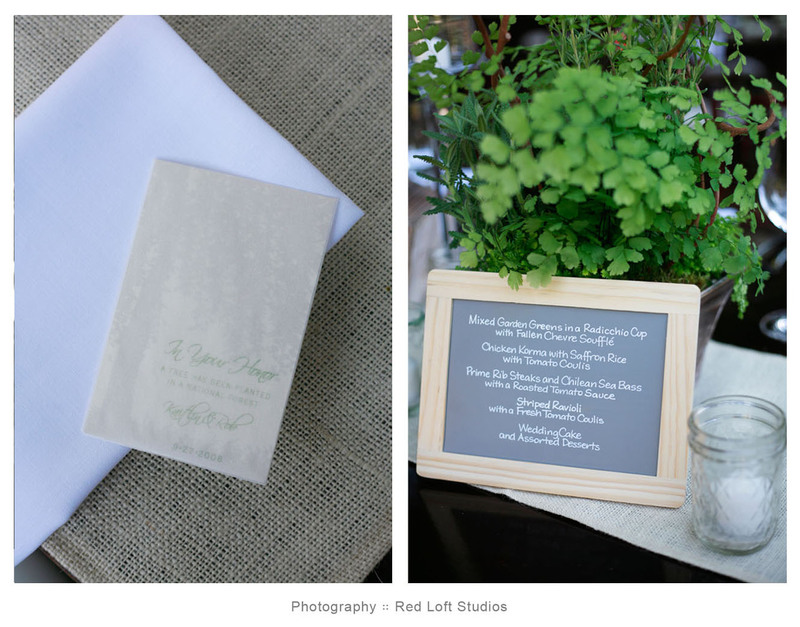 Here are a few photos of some of the items which were generously provided by the wedding photographer Red Loft Studios. I must send a shout out to Jenny Stafford for taking the time and making a special effort to send a CD with images so I could post them on my new blog! Lisa Gorjestani of Details Event Planning once again created an outstandingly elegant event. Over the six years we have worked together she has had me write on everything from rocks to chandelier crystals! (I’ll post pics of the crystals another day.) For this wedding I handlettered the menus on chalkboards that were placed on each table as well as signs that were used at each buffet station. 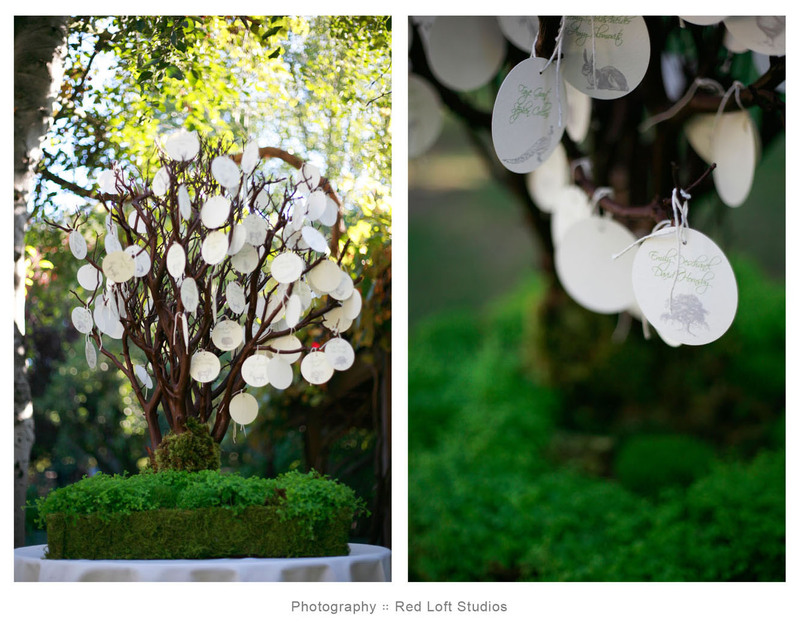 The seating card rounds were hung from a manzanita branch tree, the base of which was covered with beautiful moss. 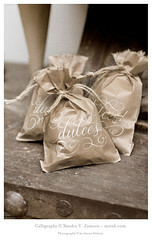 The favours were made in the style of a seed packet and inside the glassine envelope was a note to their guests honoring them by planting a tree in a National Forest. The wedding was featured in the Spring 2009 issue of InStyle Weddings and is online at the InStyle Weddings website. You can also see some additional pictures and a nice description of the wedding at Green Wedding Shoes.